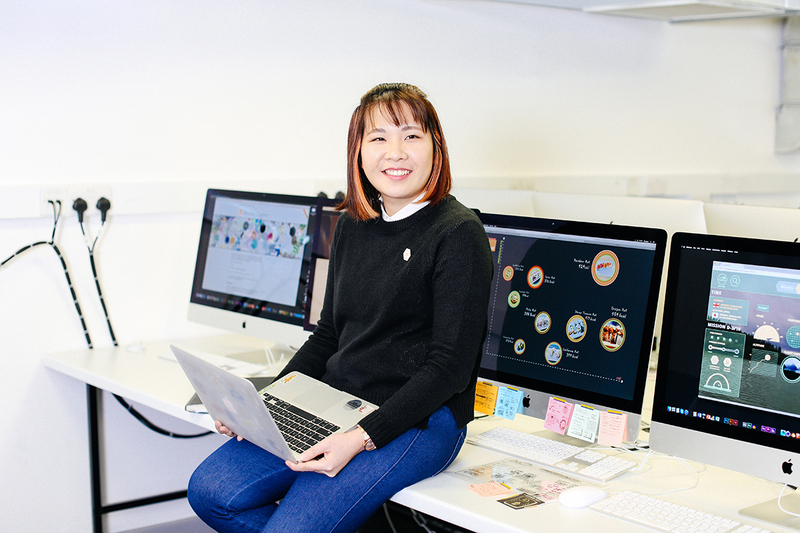 I graduated from BA (Hons) Information and Interface Design (now BA (Hons) User Experience Design) in 2018. Being able to collaborate with people from all over the world on different projects and also showcasing projects to create new topic of discussions. I wanted to experience a new culture out of Asia and felt the need to improve my conceptualising skills and design thinking. Being exposed to a diverse culture at LCC and in London is definitely different. As for the course, I realised I was interested in pursuing UX/UI as part of my degree – learning about data visualisation was a bonus and the job prospects after studying this course was very positive. At LCC, I got to work with brilliant technicians, their knowledge of their field is really mind-blowing, and they are such experts in it. There are a two data visualisation projects that left a deep impression on me. The first was a poster that focused on revealing the number of child deaths in comparison to total deaths by air strike in Aleppo, Syria for a time-lapse of 6 months. The other was a project mapping on petri dishes to envision London’s SE1 as a living organism and analyses the varying mood of the area depending on different elements within it. Identifying Well-being, Crime, Fire and Mortality as a set of interconnected factors that contribute to the changing image of the neighbourhood, this project visually explores and compares these affecting factors to get a micro perspective into the evolution of London’s SE1. These two projects had very meaningful data and the message put across to our viewers sparked world and society conversations. Currently, I have just started working with a local design consultancy in Singapore – STUCK.sg. They first started off as a product design firm and slowly branched out to doing UI/UX 5 years ago. I’m now mainly involved in designing system interfaces for government sectors in Singapore. Travelling to a new place/country, my macbook with design software’s and sleep (a fresh mind always generates better ideas!). I always feel very inspired while travelling and it takes my mind off things while exploring new finds. So, I hope to be travelling or working in a new environment besides my home country. I also love working on installations, so I hope to create a space to exhibit my works build from scratch one day – that’s probably my 10-year goal. Converse to as many people when there’s chance, as that provides more insights than just battling projects on your own. The libraries – the resources we have in the LCC and CSM libraries are true gems. Besides that, I’ll find out if there are any new exhibitions in London and visit them when I feel unproductive.